I want to talk about some unexpected and counterintuitive findings that run against what we might anticipate as chemists: that the introduction of a highly electronegative fluorine atom into a molecule necessarily increases the H-bond properties of adjacent functional groups. I refer to the work by Linclau and co-workers, which was published in Angewandte a couple of years ago. The cyclohexane-bound hydroxyl group was investigated in this study. The focus was on H-bond property of the OH functionality, which was measured using a really nice method: by looking at the decrease in absorbance of the hydroxyl substituent’s IR stretching band upon complexation with N-methylpyrrolidinone (NMP). Very cool stuff. Importantly, the paper casts doubt on the assumption that fluorination always increases H-bond acidity. There is a simple explanation of the observed effect – just take a look at the two representative examples shown below. 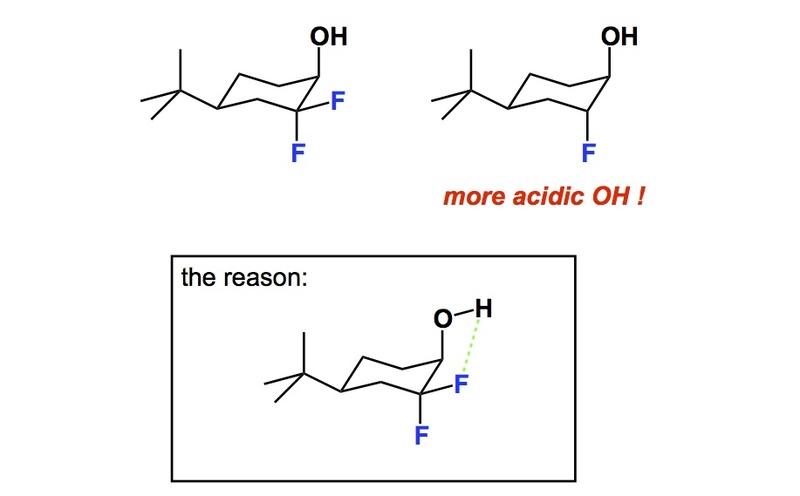 The main lesson here is that fluorination can attenuate alcohol H-bond acidity in unanticipated ways. The intramolecular F···HO interaction can in fact be responsible for a decrease in H-bond acidity. Clearly, this intramolecular interaction can effectively outcompete the electron-withdrawing effect of fluorine which is expected to lead to increased acidity of the adjacent polar groups. The Linclau study opens doors for rational modification of acidity through site-selective fluorination and should have many applications in the design of bioactive molecules. Interesting effect, although the proposed explanation seems to contradict this classic Jack Dunitz article (Chem. Eur. J. 1997, 3(1), 89–98. ), which suggest that covalent-bound fluorine is a poor hydrogen bond acceptor. It is certainly possible that there are solvation effects present here but obviously not in the solid phase. The Dunitz work is quite well known in the organocatalysis community (and I assume in medchem) and I wonder if these new findings by Linclau et al. have any consequences for the understanding or design of Schreiner-type thioureas, for example.